You can learn more about each of these in vignette("forcats"). 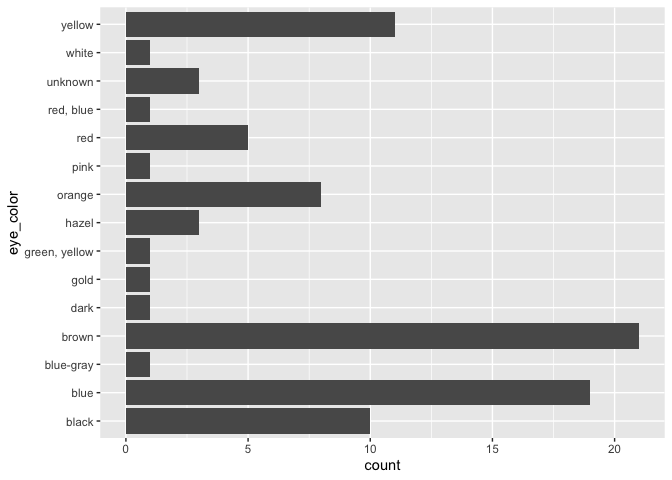 If you're new to factors, the best place to start is the chapter on factors in R for Data Science. Please note that the 'forcats' project is released with a Contributor Code of Conduct. By contributing to this project, you agree to abide by its terms. fct_inseq() reorders labels in numeric order, if possible (#145, @kbodwin). fct_lump_min() preserves levels that appear at least min times (can also be used with the w weighted argument) (@robinsones, #142). fct_match() performs validated matching, providing a safer alternative to f %in% c("x", "y") which silently returns FALSE if "x" or "y" are not levels of f (e.g. because of a typo) (#126, @jonocarroll). fct_relevel() can now level factors using a function that is passed the current levels (#117). 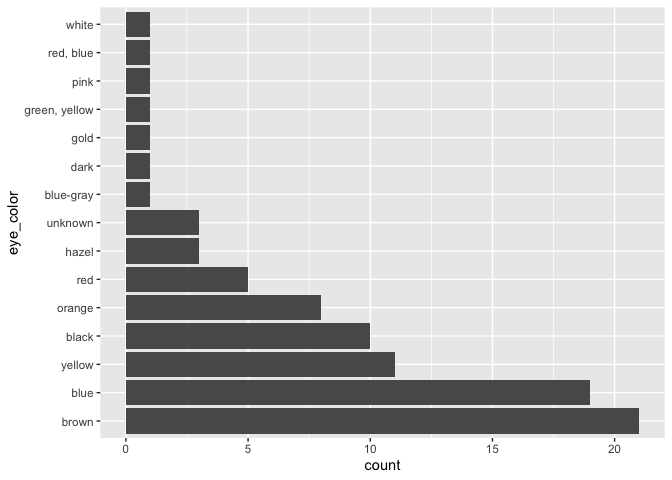 fct_count() gains a parameter to also compute the proportion (@zhiiiyang, #146). fct_lump() now does not change the label if no lumping occurs (@zhiiiyang, #130). fct_relabel() now accepts character input. fct_reorder() and fct_reorder2() no longer require that the summary function return a numeric vector of length 1; instead it can return any orderable vector of length 1 (#147). fct_reorder(), fct_reorder2() and as_factor() now use the ellipsis package to warn if you pass in named components to ... (#174). fct_c() now requires explicit splicing with !!! if you have a list of factors that you want to combine. This is consistent with an emerging standards for handling ... throughout the tidyverse. fct_reorder() and fct_reorder2() have renamed fun to .fun to avoid spurious matching of named arguments. All functions that take ... use "tidy" dots: this means that you use can !!! to splice in a list of values, and trailing empty arguments are automatically removed. Additionally, all other arguments gain a . prefix in order to avoid unhelpful matching of named arguments (#110). fct_lump() gains w argument (#70, @wilkox) to weight value frequencies before lumping them together (#68). as_factor() and fct_inorder() accept NA levels (#98). fct_explicit_na() also replaces NAs encoded in levels. Test coverage increased from 80% to 99%. fct_drop() now preserves attributes (#83). fct_expand() and lvls_expand() now also take character vectors (#99). as_factor() which works like as.factor() but orders levels by appearance to avoid differences between locales (#39). fct_relabel() allows programmatic relabeling of levels (#50, @krlmlr). fct_c() can take either a list of factors or individual factors (#42). fct_drop() gains only argument to restrict which levels are dropped (#69) and no longer adds NA level if not present (#52). fct_recode() is now checks that each new value is of length 1 (#56). fct_relevel() gains after argument so you can also move levels to the end (or any other position you like) (#29). lvls_reorder(), fct_inorder(), and fct_infreq() gain an ordered argument, allowing you to override the existing "ordered" status (#54).